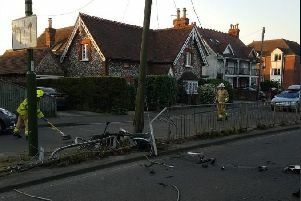 Police have named the elderly woman who was killed last week in Bognor Regis when she was in collision with a car. The woman has been named as 92-year-old Dulcie Roberts of Grassmere Close, Felpham. Emergency services were called to the scene outside the Post Office in Felpham Road, Bognor, at 12.26pm on Wednesday, January 13. Police have said that a Nissan Micra car, driven by an 87-year-old woman from Bognor Regis, was leaving a parking space near local shops when it was in collision with the victim, who was a pedestrian. Despite the best efforts of paramedics and a doctor from an air ambulance, she was pronounced dead at the scene at 1.16pm. Officers from the serious collision investigation unit are investigating the incident and have asked for any witnesses to email collision.appeal@sussex.pnn.police.uk or call 101 quoting Operation Nathan.